Germs and risk of illness is higher in the winter so professional cleaning for your business is essential. Every year as many as 20% of Americans are struck with flu and this in turn results in a cost of up to $7bn in sick days and lost productivity for US companies. While not all flu and illness is something you can deal with as an employer, evidence suggests that 80% of flu cases are spread by touching contaminated surfaces and by direct human contact. This means a clean and sanitized workplace is more essential than ever in the colder months when flu and similar viruses strike. Contacting your professional cleaning partner for an additional round of deep cleans or scheduled cleaning sessions is the first place to begin when preparing for winter and protecting both your workforce and your customers. There are some other things you can do too. Protecting your premises in the most basic ways can include installing weather stripping and ensuring your guttering and drains are fully cleaned and prepared. Removing any blocks or build-up early on in the season can help ensure you aren’t caught out when even more leaves fall or should snow, and ice also block up any piping or drains. Heating systems and ventilation should be fully checked. Fireplaces and chimneys in the office or on-site should be checked over and a full annual check of your premises heating, ventilation and air conditioning system should be arranged. Your HVAC system needs to function effectively throughout the winter to ensure a safe and hygienic working environment and if it isn’t professionally cleaned, it is at risk of mold build-up as well as other pollutants and allergens. At Penn Jersey our professional teams work with all of our customers and clients to arrange effective winter cleaning schedules. This can be particularly important if you have exterior premises which need cleaning and deliver that lasting first impression to your clients. Below are some of the basic winter cleaning essentials you can expect from our professional cleaners. As mentioned, the exterior of your premises is what your clients and customers first see so it needs to be safe, clean and easy to access. Our exterior cleaning services ensure the outside of your property is fully cleaned and safe to use. This can involve pressure washing of parking lots, sidewalks and walls. It can also involve the aforementioned roof and guttering cleaning, which ensures the premises are completely ready for any snow or ice which may arrive as the colder months take hold. As already mentioned, the spread of germs is much increased in the winter months as we all are more susceptible to colds, flu and other viruses. Proper, regular cleaning is absolutely essential for managing allergen and germs within your premises. From replacing air filters to duct cleaning and your daily janitorial cleaning services, allergen and germ prevention is at the heart of what any reliable cleaning provider offers. Regular cleaning also helps stop the risk of mold build up which can come as you switch the heating on and moisture forms around the premises. Mold can be damaging to the respiratory system, irritate the skin and has no place in any healthy and functioning workplace. Carpets can be a real advantage during the colder months of the year. If you have carpets in your premises then you’ll benefit from the added insulation they bring but as it’s wetter and colder outside, more mud and dirt is brought in on our shoes. A dirty carpet can harbor a huge range of different germs including the flu virus and allergens. The American College of Allergy, Asthma and Immunology warns that irritants and allergens can easily build up in unclean carpets and cause flares for allergy sufferers or even exacerbate symptoms of winter illnesses. Commercial carpet cleaning can be organized on a regular contract with Penn Jersey or we can come in for one-off deep clean sessions or similar. 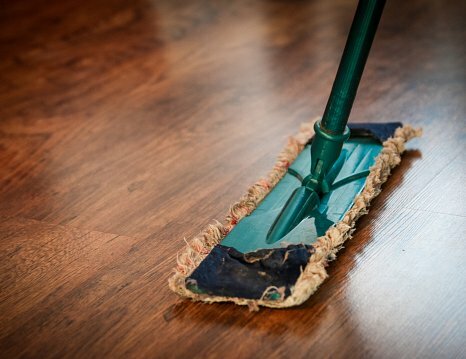 It is also important to note the importance of clean and dry floors for safety purposes for your clients and staff. Wetter and colder weather can result in much higher risk of slips and falls and while you can ask customers and staff to try to dry off at the door, ensuring that floors are kept fully clean is on responsibility of the business owner. The best and only way to keep winter germs at bay is to keep things clean and while professional cleaning is core to this, your workforce needs a mentality of keeping their own workspace clean and sanitized. Research consistently shows that the average desk is up to 400 times dirtier than the average toilet seat, so keeping on top of the basics day to day is something all employees need to be aware of. The well-known “Wash, Wipe, Sanitize” protocol should become gospel in the workplace and it can help reduce the spread of flu and similar viruses significantly. Employees should have access to basic cleaning supplies in your staff room or supply cupboard and they should be able to wipe up after each day’s work. Your professional cleaning partner will carry out the regular and in-depth cleaning duties, but a quick wipe could avoid the unnecessary spread of germs.